Another quick little creation I forgot to show you yesterday, featuring Stitched Sentiments & Stitched Flowers stamp sets, designed by Nina B.
I stamped this lovely little flower on some patterned paper & then cut it out. Surprisingly, it didn't take as long as I suspected it would, which is a really great thing! It means that this will become one of my newest favourite go-to sets to create teensy flowers any time I need to add a bit of a floral touch! 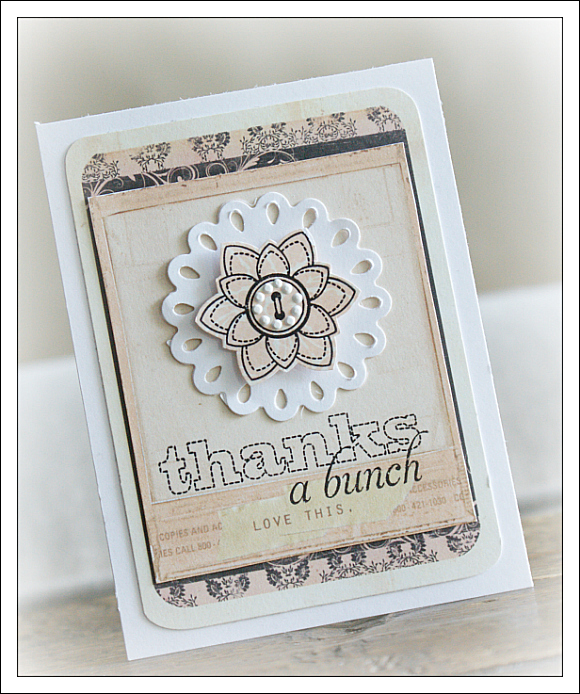 The sentiment on this card is just another example of all the lovely bits you can find in the Stitched Sentiment stamp set. Hope you all have a lovely day!!! Totally gorgeous. Love all the elements in your card.